When the founding team members of Shinola were deciding where to locate their company, Detroit was a very early and strong favorite. 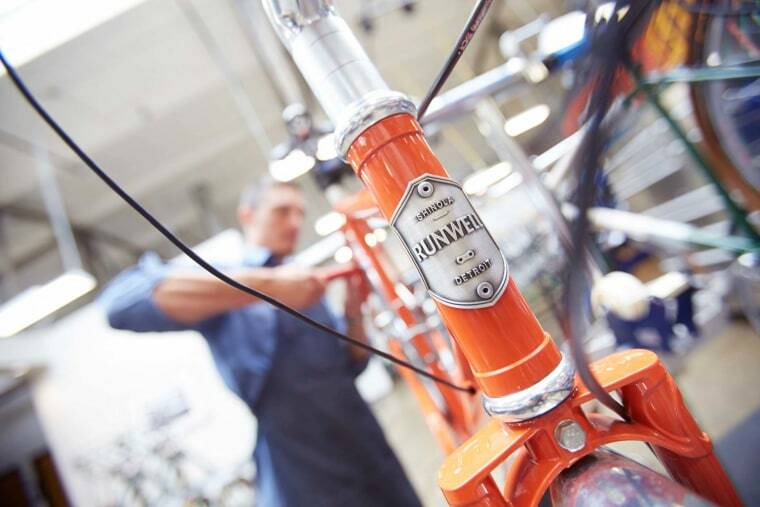 Shinola manufactures a variety of high quality handcrafted products, including watches, leather goods, bicycles in the $1,000 to $3,000 range and high-end pet products (a tonal leather dog leash sells for $125.00). Steve Bock, the president of Bedrock, the holding company for Shinola, explained that they were attracted to the city because its history is steeped in manufacturing. “If you look at what Detroit stands for and the future of the city, it became an ideal choice to situate our base,” he said. In June 2013 Shinola opened its Midtown store. That same month, the company built 55,000 watches, which it offered for sale in its Midtown store, other outlets around the country, and online. The watches sold out in 6 months. It opened a sister store to Shinola, Willys Detroit, in June 2014. “It was Detroit from the beginning and we’ve never looked back,” Bock said. For many years, Detroit would not have been the first location to spring to mind when business leaders were considering where to build their base. The city was associated with a declining auto industry, high crime, blighted neighborhoods and poverty. But that landscape is rapidly changing. Since 2006, $12 billion has been invested in commercial, industrial and residential properties in the city. Detroit has experienced a net increase of 11,000 jobs since 2010, according to an April 2015 report from the Global Cities Initiative: a Joint Project of Brookings and JP Morgan Chase. Young people are flocking to the city; 19% of the population is made up of 25 to 34-year-olds. Occupancy rates for the downtown area are at 98%, and 1,300 residential units are currently being built. Over the past year, an astonishing 107 new restaurants have opened in the city. “It’s become a foodie place because a lot of the young, creative class are being attracted here,” said Sandy Baruah, CEO of the Detroit Regional Chamber. Will Leather Goods, an Oregon-based lifestyle brand, is expected to open a 9,000-square-foot retail center in Detroit in September 2015. The store will be the eighth U.S. location for CEO and founder William Adler, a Detroit native. Adler credited Midtown Detroit Inc., a nonprofit development group, for helping him purchase a building and find grant money to renovate a dilapidated grocery store. He said, “The city is burgeoning. There’s a wave of creative artists and creative business people coming back.” He called Detroit “the Soho of the Midwest.” Part of his attraction to Detroit was the local talent pool, which includes students from the many nearby universities, like Wayne State University, Michigan State University and the University of Michigan. GalaxESolutions, which provides products and software to help move data in industries like health care and financial services, was one of the first outside companies to establish a significant operation in Detroit – despite having no historical ties to the city. Tim Bryan, GalaxESolutions’ CEO, said, “We moved there because we thought it was a fantastic business opportunity.” Detroit became home to the company’s second domestic software development facility in 2010. Bryan said he was able to tap into the talent of former autoworkers who were laid off and they retrained them. Operating in Detroit proved far less expensive than Silicon Valley or New York, due in part to its appealing real estate prices. Leasing rates are at $19.29 per square foot in Detroit; that number is $39.18 for Chicago and $65.46 for New York, according to Reis, Inc. Bryan said that since he’s been there “the city has gone from being a place where you could get cost-effective systems built to a place where you can get the greatest degrees of innovation in information technology than anywhere in the world.” He said the Campus Martius area, where his company is located, is surrounded by the best public parks in America, as well as major sports arenas, restaurants, bars and clubs. The city is the site of one of the most active international border crossings in the world - a significant selling point for Cindy Pasky, who founded her company, Strategic Staffing Solutions, a $264-million IT and business services corporation, in Detroit in 1990. The company now has more than 2,700 consultants and 31 offices in the U.S. and Europe. Pasky said the Detroit Metropolitan Airport, a mere 20 miles from downtown Detroit, is consistently ranked as one of the top international airports in the world. It offers 280 international flights weekly. Pasky, who lives downtown, says she is “proof that Detroit is an asset,” evidence that you can successfully grow a global company based there. Another key resource for entrepreneurs is Techtown Detroit, a business accelerator and incubator that leverages Wayne State University’s research and technology, business insight and student talent. Between 2007 and 2014, Techtown Detroit served 1,116 companies, raising over $107.26 million in start-up capital and contributing 1,190 jobs to the local economy. A total of 21 companies were created in 2014 alone. Techtown Detroit has a message for those considering locating in Detroit: “If you’re a business owner, we can help you, regardless of what your needs are,” said Ned Staebler, Techtown’s president and CEO. He said that Detroit has one of the most “robust business support networks in the country.” Restaurants and coffee shops are flourishing, but there’s a huge need for more, creating significant opportunities for those interested in the retail industry, said Staebler. Digital health care and the electrification of vehicles are also fast-growing industries in the city, he said.